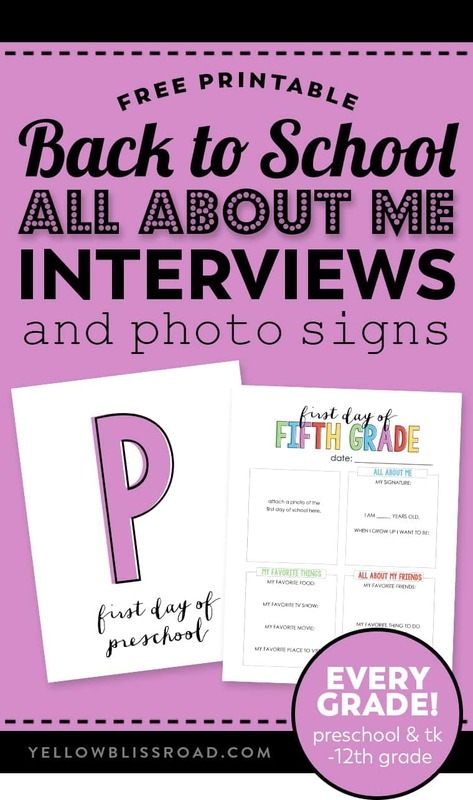 These First Day of School “All About Me” Free Printables are just what you need for your annual back to school traditions. They’ll help preserve the memories of your children’s unique personalities from year to year. 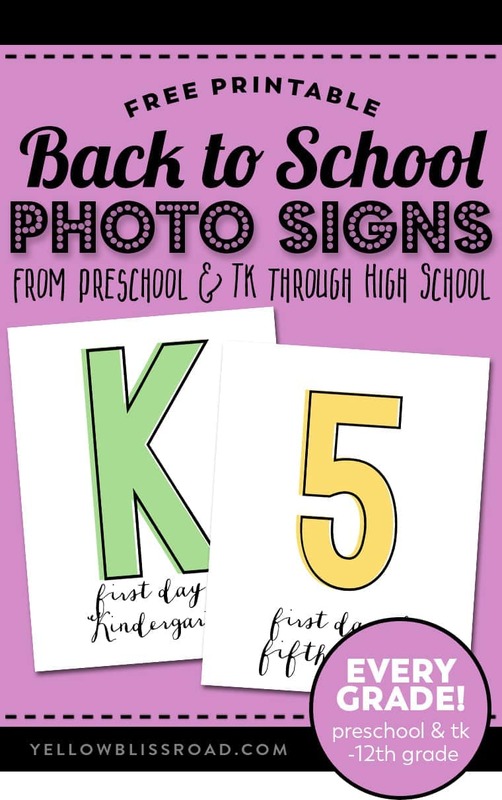 There are also matching photo signs for every grade from preschool and Transitional Kindergarten through 12th grade! *This post was written in 2014 and the graphics have been updated for 2017. With the First Day of School rapidly approaching, I’ve been thinking a lot about how to preserve that day. It’s an emotional day for a lot of parents, and children, but it’s also so exciting. For me, it will be bittersweet as my youngest enters grade school, but I will also get some much needed time to focus on working on the blog and the house, and myself, daily. I’m looking forward to that. It’s exciting to see them grow and transitional into “older” children – they aren’t “little” anymore! I thought it would be a good time to take a chance to preserve this moment in time with an “All About Me” questionnaire. 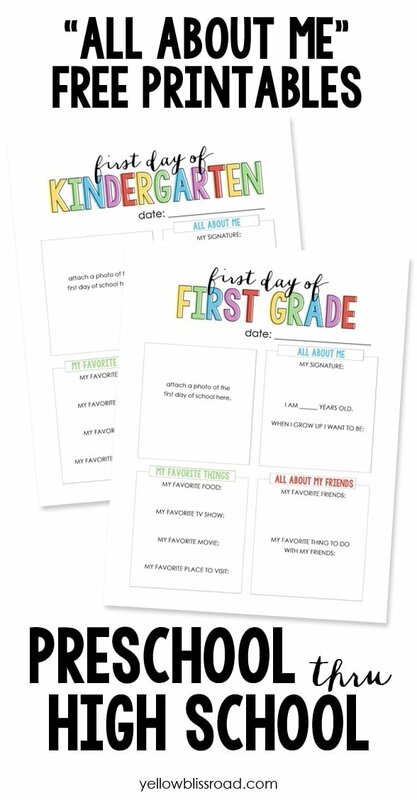 It’s perfect to help remember where your kids were at as they entered each grade in school, and I know it will be so much fun to look back at the end of the year and see how much their answers change. Today I’m sharing the free printable that I created, and tomorrow I’ll share the coordinating photo props! 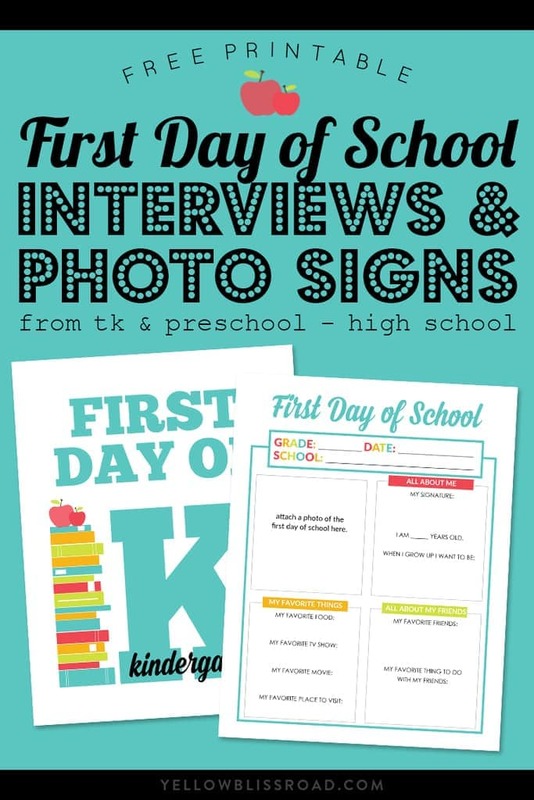 The printables are available for Preschool and Pre-K/Transitional Kindergarten (just added!) through High School, in case you’re able to talk your high schooler into filling one out! Want the matching Photo Props? Find them HERE or by clicking the image below. Hi Kristin. These are amazing. Thank you very much for sharing them. I was wondering if you by any chance have the ones to match with the last day of school? Thanks again! these are the best, thank you SO much! Thank you Sarah! and thanks for stopping by! I know this is an old post. I’ve been using these for three years. I can not get them to print properly this year. I’ve tried rebooting my computer and my printer multiple times. I keep getting 4 black rectangle in the “interview/picture” blanks. I’ve even updated my Adobe. Thank you SO much for these! I love having my kids fill out the questionnaire and holding up the signs each year! This will be our third year to use them, and I’m so glad we found them before my oldest started kindergarten. Just planning ahead…any chance you’d add a “First Day of College” page? Or give us a hint on fonts so I could try to make one? I can open and download the first day of school “back to school” printables, but when I go to print them, I get an error and it says there is nothing to print; yet I can see it on my screen. Any ideas why? Thanks!! I was able to open it in another browser. I got the last day of school interviews to load and print no problem but I can’t even get the first day of school interviews to open. Any ideas? I have a 18 month old son who I would like to start teaching him insteading out putting him in a headstart program. Do you have any tips or printables that would help? First and foremost let me start off by saying I love your site and pintable’s! I am however having trouble printing, saving and or downloading all of the back to school about me’s. I have downloaded, printed and saved all your other documents without issue but I am unable to print these from the site directly form another window or even saving to the computer. Any help would be great! Thank you! I’m sorry you’re having trouble. If you let the pages load completely after downloading them to your computer, that should work. But also check that your Adobe program is up to date. I feel your pain! I had to try three different computers to find one that would print them correctly. The one that worked was the one with the most outdated programs — I think the latest updates is causing something wrong with printing and loading them maybe. My friend was able to print hers by trying a different web browser to pull them up — you may try that and see if it works for you. Someone may have already asked this questions and if soI am sorry I missed it. But I was wondering if there were questions for the last day of school? It would be neat to see the change not only in the pictures but also in the answers to the questions. Thanks!! I love this idea! I have been searching for interview sheets and these are adorable. I was able to view/print the last day of school interview sheets but these first day of school sheets wont load. Any ideas?